The Internet's amazing. But, it's such a double-edged sword. You can find out copious amounts of information out there, but for a lot of it, you can't tell what the original source for any story is anymore. 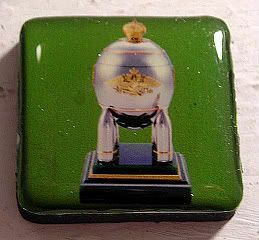 Take for example, this Faberge egg from my magnet set. I pulled up three different sites - one not updated since 2001, another one from a random Faberge expert site, and the last from PBS. All of them have the same information - in some cases, the same exact wording - but, none cited the other, or any other sites. Bizarre. So, here I am, trying to tell you about this Faberge egg, but have only the three above sites to refer to. Consider them cited, but use this one for what seems to be the full story about this particular supercool egg. Actually, there's a couple of cool stories about it. To put it in context, it's 1916, the midst of World War I. Russia was in turmoil, and at that point, Faberge's workshop was actually closed, because his craftsmen were off fighting. Materials were scarce, indeed, no way were jewelers allowed to work with precious metals. And, if you think about it - these fabulous eggs were most likely the height of disposable income. But, Nicholas II wanted his egg for Alexandra, and so he asked for it to be made, and Faberge did the best he could with what he had, using bits of gold, steel, silk, velvet and a cheaper form of jade. The steel egg sits atop four steel artillery shells - which is a little discomfiting, seeing something so gorgeous and precious on top of four somethings so destructive. But, it's quite a strong piece, even in its lack of usual Faberge flash and dash. The surprise inside is a miniature painting on ivory of Nicholas II and his son leading the troops at the front. There's like a whole story about how Nicholas replaced his cousin at the front, and how he got the Order of the St. George cross, which is also included on the easel of painting. Alexandra was so enamored by the piece, she sent Nicholas one of her only happy telegrams, basically saying Thanks for the egg! Apparently, it's one of only 10 Imperial eggs that didn't get sold off - it's in the possession of the Kremlin Armory in Moscow. Huh. I wonder if they give tours.